Well, if you read PJ Bednarksi’s "VidBlog" Wednesday, you already know this publication is in transition. In fact, this is the last edition of "VidBlog" -- and Online Video Daily, for that matter -- before MediaPost integrates its video coverage into a new daily omnibus covering all digital media and platforms: Digital News Daily. What makes video different than the rest of that mix, is it isn’t a medium or a platform, but a media content format or experience. As a result, it’s also been one that’s been hard for the industry to categorize or define. A good example of that is two reports I received over the past couple of days -- Kleiner Perkins’ Mary Meeker’s most updated deck, and Magna Global’s 2017 Programmatic Report. Neither of them has an explicit breakdown for the video advertising marketplace, but lumps them into the broader category of “digital” media. Personally, I find that frustrating, because I look to these sources as definitive benchmarks for media industry markets. It’s frustrating, because we all know that consumption of video content is growing, and advertising impressions within it, but there’s no neat way of putting your arms around it. It’s also frustrating, because “video” traverses a spectrum from pure-play digital video -- online and mobile Internet or apps -- to over-the-top TV and subscription video services to conventional TV. Most frustrating of all is the fact that we know those newer forms are growing fast, but there’s not way to measure its relative share. 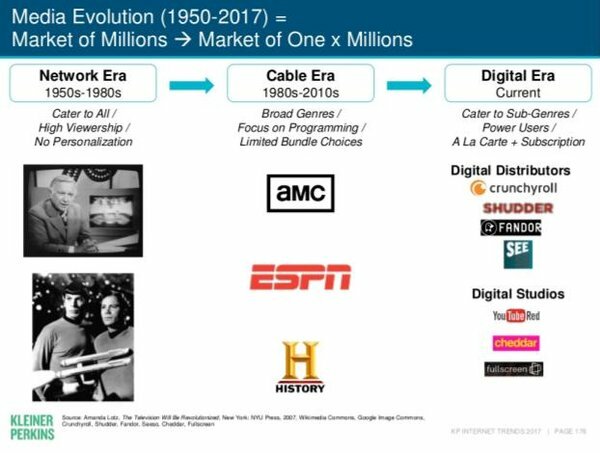 Just like cable expanded broadcast’s television “universe,” digital video is expanding the “video universe.” The question is by how much?